Step 1: Start by placing a box, chair, Stability ball, or flat bench on the ground behind you. Step 2: Put your feet up on to the chair. Set your feet so that only your toes are touching the platform. Step 3: Place your forearms on the floor. Make sure that your elbows are directly inline with your shoulders. Step 4: Now align your body so that it forms a straight vertical line from your head to your heels. Focus on tightening your whole body making yourself as stiff as possible. Step 5: Hold this position for the time that you have selected. You have now completed your first set of Decline Plank. Repeat for the desired amount of sets that you have selected. The Decline Plank is an intermediate difficulty level exercise. You should have a solid grasp on the traditional plank before you attempt to include it in your routine. You will need something for you to place your feet on to put your body at a decline angle. This platform can be anything from a bosu ball, weighted bench to using the stairs in your house. Another useful piece of equipment to have is a weighted vest. Using a weighted vest will allow you to continue making progress by slowly loading more and more weight each time you perform this exercise. Check out Titans vest it allows you to load up to 100 pounds in increments of 2 lbs. The Primary muscles that get worked by this lift are your Core and Shoulders. The Secondary muscles involved are your Lower Back, Glutes and the Hip Flexors. Helps to increase your strength while improving your balance and stability. Since your feet are at a higher incline, more weight gets placed on your shoulders than the traditional plank variation. Strengthening your core can help reduce your chances of injury in the gym and your daily activities. Building up your core can also limit back pain and in some cases remove it entirely. You can do it without any equipment. Make sure you keep your body in a straight line the entire time you are performing this exercise. Using this Decline variation of the plank will add more of a focus on to your shoulders. If you want to provide maximal work to your core, then your body needs to be parallel to the floor. When your lower body is at a higher angle, your shoulders are required to support more of your body's weight. If you want to place even more work on your shoulders, you can use a higher platform for your feet and use the top of the pushup position. Just make sure your palms are directly under your shoulders. To help increase the amount of core work done you can move your feet closer together. The closer together your feet are to one another, the more your core gets required to help balance your body. Building a strong core will help your lower back to remain injury free and can increase the weight you can move on other compound lifts like your Squats and Deadlifts. 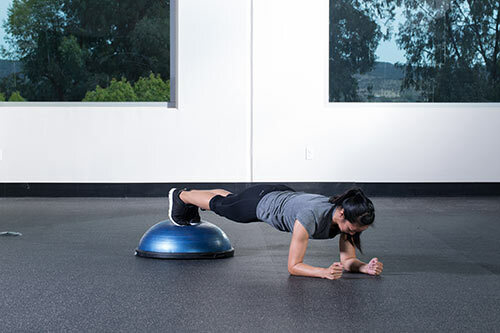 While this exercise does provide some core training it much less efficient than the traditional plank and other more efficient exercises that could be used to train similar muscle groups. So if you are just looking for some variation in your training routine, you might as well through this exercise in now and then. Beyond that, I think this is quite an inefficient exercise.